With so much to see and do in this exciting city, it can be hard to know where to start! 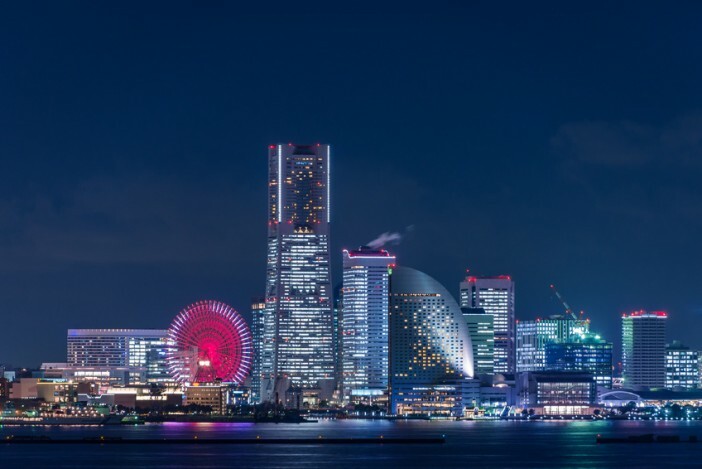 That’s why we’ve created this handy guide to all the things you should see, do and eat in Yokohama, so you can fit in all the good stuff no matter how short your visit. Landmark Tower is an iconic feature of Yokohama’s skyline, but one of the city’s best views is from inside it. Soar to the top in Japan’s fastest elevator and take in the amazing 360 degree views from the Sky Garden Observation Deck on the 69th floor. Head up at night to enjoy the sparkling cityscape with a fine Japanese whisky. You’ll find the tower a short walk from the Minato Mirai Station and it costs around 1000 yen per adult to take in the views from the top. Shomyoji Temple is one of Yokohama’s hidden gems, a drop of calm in the middle of the bustling city. Built in the 13th century, the Buddhist temple is a wonderful insight into Yokohama before it became the glittering metropolis it is today. The garden around the temple was designed to represent the Buddhist Paradise in the real world, with the arched red bridges connecting this world to the future world. It’s a beautiful place to explore and experience the cultural heritage of the area. This traditional Japanese garden in the south of Yokohama is popular among locals and visitors alike. Opened in 1906, it encompasses 175,000 square metres of lush greenery, with ponds, streams and paths winding through the serene space. Once a private estate, the wealthy silk merchant who owned the garden oversaw the landscaping and design himself. Historical building that have been collected from all over Japan can be found throughout the garden. Allow a few hours to wander around and absorb a little of Yokohama’s history. If you’re visiting the city in August, exploring Minato Mirai to find the thousands of Pikachu dancing in different areas is a must. Called the Pikachu Army, the event is much anticipated by children and adults alike. You can usually find them around Landmark Tower, Minato Mirai Station, World Porters, and Sakuragicho Station, so look out for them while you’re sightseeing and join in the dance. It might not sound like your idea of the perfect day out, but the Cup Noodle Museum is both surprisingly fun and surprisingly interesting. A must for kids of all ages, the museum has fun exhibits explaining the history of cup noodles and their manufacture. The best part, though, is getting to make your own ramen by mixing and matching various soups and ingredients in packaging you’ve designed. Snack on your noodle innovation afterwards and decide if you think it’s going to be a delicious success or a disgusting flop. Sea Paradise is located on an island at the tip of Yokohama Bay. Along with rides and other attractions, it has one of Japan’s top aquariums. With over 500 varieties of fish and around 100,000 sea creatures, it’s a fascinating way to discover some of Japan’s marine life. The huge undersea viewing tunnel will give you a whole new perspective on life in the bay. If you crave a little more excitement, jump on one of the rollercoasters that takes you out over the water for the ultimate adrenaline hit. Museum isn’t really the right word to describe this amazing food hall that is dedicated to all things ramen. Spread over three floors, vendors serve ramen from different regions of Japan, with every kind of noodle, broth and topping you can imagine. If you are planning on sampling range of delicious noodle broths, opt for the mini ramen that is designed to allow visitors to try as many different varieties as possible. Not strictly food, but the Yokohama Brewery deserves a mention for its heavenly beers. It’s the oldest microbrewery in Japan and has won several awards for its high quality products. The Brewery serves larger, ale, pilsner and pale ale on tap, as well as plenty of other beers for you to try. If all the beer has left you a little light headed, you can head upstairs to the restaurant, where the combination of both Asian and Western cuisine is designed to complement the beers. Pompadour is actually a chain bakery, but it’s getting a mention because you have to sample curry doughnuts whilst you’re in Yokohama and this is the easiest place to find them. The Japanese have a variety of sweet curries, and these delicious curry doughnuts are a great way to try it. Invented in Yokohama in the 1920s, they have been popular ever since. The curry is wrapped in floury dough and deep fried to create the perfect on the go snack. If this guide has made you want to visit Yokohama, why not book one of Cruise1st Australia’s amazing Asia cruise deals? Browse the full collection online, or call our friendly team on 1300 857 345 to book your place.